We first thought these might be Gila Topminnows, a native fish recently reintroduced into the Sabino system. But it turns out these are Gila Chub, fine native fish in their own right. These are all our hungry and curious little chubs. I have not had the opportunity to place a trap in the water in Sabino to determine if they topminnow have persisted since their reintroduction to the system. Perhaps I will get a chance this winter. [on distinguishing between the species] The basic idea to keep in mind is that topminnows are essentially guppies. But, since they are not bred for show, they don’t have extravagant fins or tails. 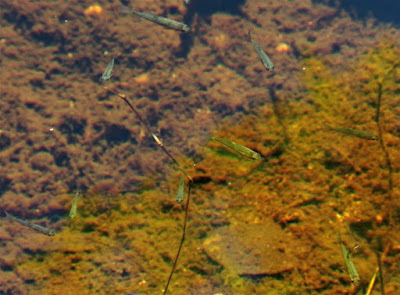 The first thing to look for to distinguish between chub and topminnow is the tail: Chub tails are deeply forked; topminnow are somewhat rounded. Second, the position of the mouth can be helpful. Chub are mid-water hunters so they have a terminal mouth (i.e. the margin of the mouth opens outward toward the front and is not slanted either upward or downward). Topminnow by contrast have a mouth that slopes upward and opens at the top of their skull (called “superior” in ichthyological terms) like a tarpon or arawana. 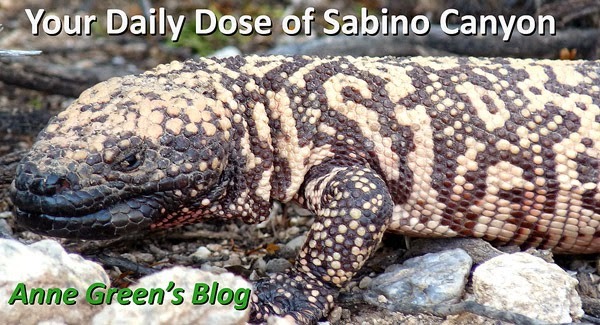 Your Daily Dose: Your Source for ichthyological news from Sabino Canyon!